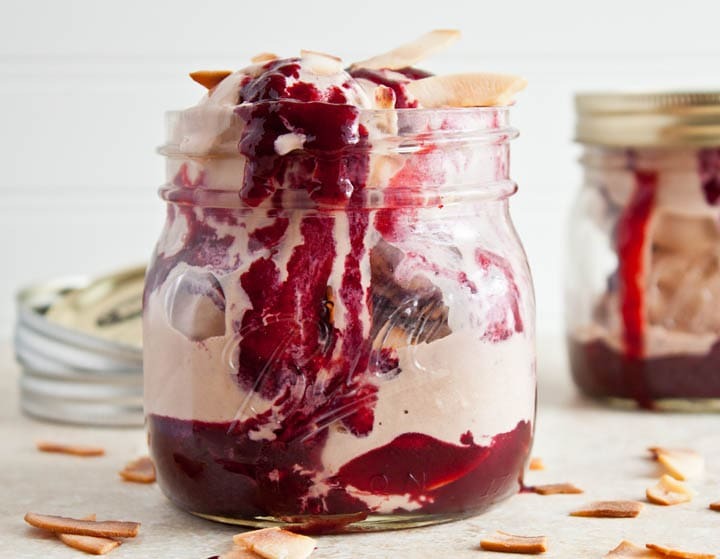 At this point, y’all are like ‘oh my lands, another mason jar dessert? !’ I know, I know. But but but, mason jars make it so easy to portion for two! Unless… you want to purchase stock in Sur La Table and buy many little pans to make my desserts. No? Just me? And my Mom? Ok, got it. I had a hunch. 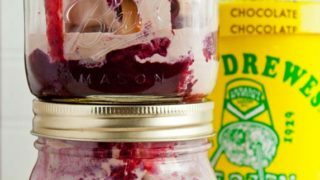 I make these ice cream sundae jars and stash them in the freezer for a quick snack. Speaking of these large coconut chips, I made Mr. Dessert for Two drive me to a store on the other side of the city just to buy them. So, if you could, please tell me how adorable they are and how this dessert would be incomplete without them? Help me justify my food purchases to my husband, please. He doesn’t get it. You do. I know you do. Hey, St. Louisans: You were SO RIGHT about Ted Drewes. So so SO right. It’s like ‘what was I eating before? Ice cream? Aww, how cute, it’s trying to taste like Ted Drewes frozen custard.’ Just like that. Sorry for all the quotes. Next, puree the berries either with an immersion blender or in a regular blender. Be careful, the liquid is hot. Once pureed, strain the mixture if desired. 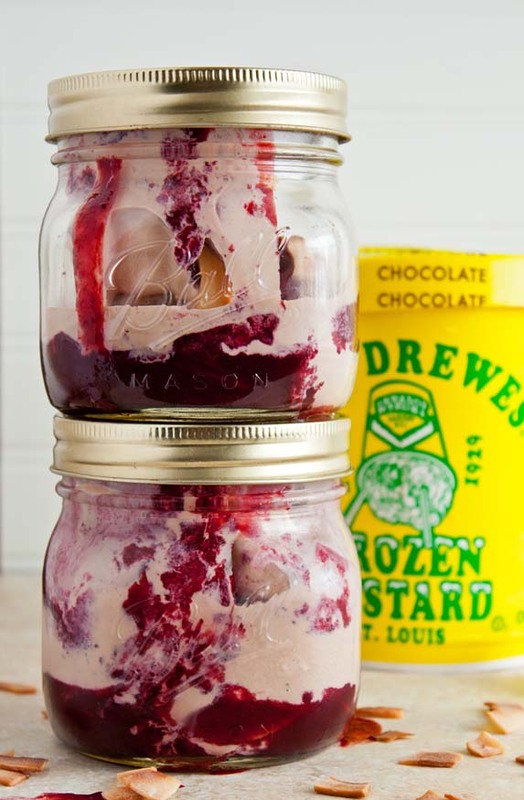 To assemble: place 1 scoop of chocolate ice cream in the bottom of a pint mason jar. Drizzle over the berry caramel sauce, and top with toasted coconut. Repeat until the jars are full. Screw on the lid and store in the freezer up to 2 weeks. Let the jar sit on the counter for a few minutes before eating to soften the berry caramel sauce. I LOVE your mason jar recipes! 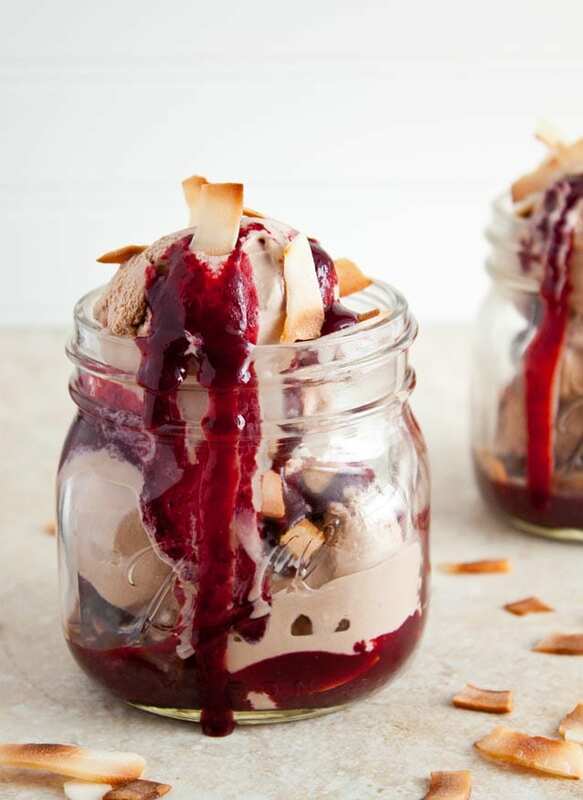 And these ice cream sundaes are a must for us over the weekend. Such a great idea, girl! Your jar recipes are the best. This one blows my mind! I love this idea! This is such a fun way to enjoy a sunday, my kids would go nuts! Dr. Mr. Dessert for Two: the coconut chips were worth it! :) Ohhh the things you do in a mason jar, my dear! I love them all! You could write a whole mason jar cookbook and I’d be sold down the river. Must eat this sundae asap! I hate when I die of ice cream-nemia and I also hate when my husband gives me “the look” when I buy food that he doesn’t understand. Yet again, this looks amazing. Its going on my list right now. Yay for frozen custard! Have you tried the Kirkwood train station? Or Silky’s in Chesterfield? Oh I miss it so much! One of the few downsides of leaving StL for Texas. Your post made me chuckle out loud this morning. I certainly don’t want to die of ice cream-nemia. LOL! You can tell the Mr that the large coconut slivers were worth the trip. At least you didn’t make him take you to the Caribbean to get real fresh coconut. You were willing to settle for these yummy slivers from the store. These look so yummy. The only thing I don’t like about your post is that the photos make me drool and I can’t just reach out and grab one to eat right now. I didn’t know you live in St. Louis! I just very recently found your blog and I’m in love! I live in Louisville, KY now with my husband but grew up in STL. We had Ted Drewes as dessert at our wedding – THE best! That’s a quick snack I’d be happy to have within my reach at all times, gorgeous! Love the idea of these, such a cute use for a mason jar! OMG. The second I spied the Ted Drewes carton in the background, I was always and forever sold on this. Just wait till you come to Wisconsin-we can binge on frozen custard all day long! Yeah, dairy’s kind of a thing here. Oh, these would absolutely positively be incomplete without the coconut chips! No question. Jars! Ice cream! Coconuts! Yes! Tell the hubs that these would not be complete without those toasted coconuts. Lovely lovely recipe my dear! Oh my goodness. Mini jars. BE STILL MY HEART! These are genius and so cute! These look so delicious! And the coconut flakes are perfect, obviously. I am now quite worried about dying from ice cream-nemia, though… luckily I have some gelato in the freezer. 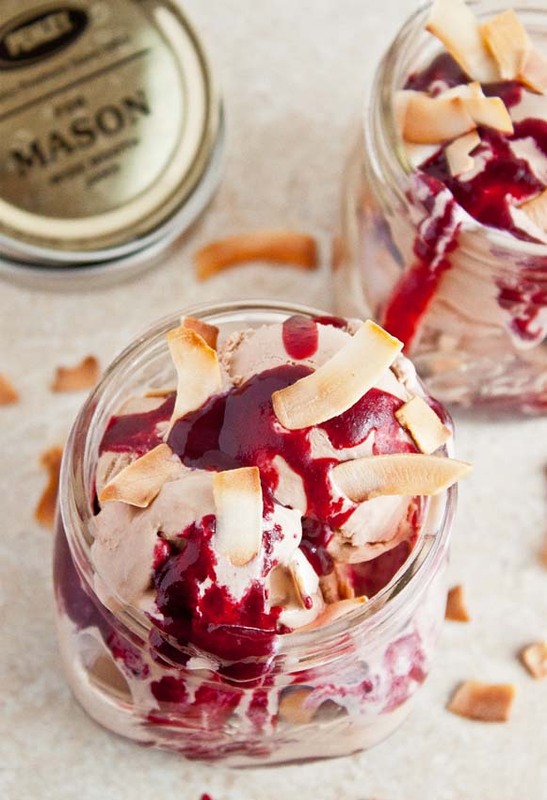 I’ll never get tired of mason jar desserts :) And yes, those toasted coconut chips totally make the sundaes extra special! Jarred sundaes is a genius idea! I am going to have stock my freezer with them! I live in Webster Groves which is on the outskirt of StL. Where did you find the coconut chips? Thanks Mr. Dessert for making this amazing treat happen! And speaking of ice cream you MUST check out Serendipity Homemade Ice Cream shop in WG. The mini trio is perfect and I recommend Gold Coast Chocolate, Salted Caramel and Swiss Chip flavor combo. You will moan enjoying the goodness!! Sometimes they offer if you wear your pajamas they will give you a coffee mug. FUN. Check them out on facebook for updates. Welcome to St Louis, if you need anything let me know!!! Can I use granulated sugar instead of powdered? Looks delic!!! Sure you can! I should have specified that. Since we’re puree-ing this mixture and heating it, it probably doesn’t matter too much. Let me know if I’m wrong though! You have such adorable recipes! Where did you find those cute mason jars?